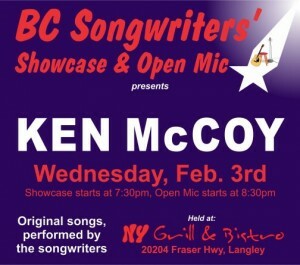 On Wednesday, February 3rd, our Songwriter Showcase features Ken McCoy… a man who can write and deliver a song, like no other! Join us at 7:30 pm for the Songwriter Showcase, and stay for the Open Mic, that starts at 8:30. 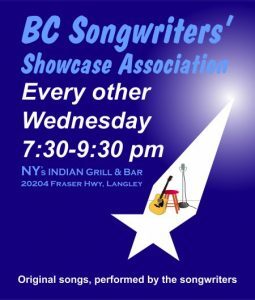 The BC Songwriters’ Showcase & Open Mic performances are held at NY Grill & Bistro – 20204 Fraser Hwy, Langley.